I gave up a kidney and got a good home. If Kitty is diagnosed with kidney failure, his prognosis depends on many factors. If he's suffering from acute kidney failure, there's a possibility it can be reversed. If it's chronic kidney failure, there's no cure, but proper management can buy him time while giving him a good quality of life. Acute kidney failure, also known as renal failure, comes on suddenly. It often results from ingesting a toxic substance, such as antifreeze leaking from a car. It also can result from trauma, urinary tract blockage or kidney infections. Kitty strains to pee, going in and out of the litter box. His breath might stink and he might throw up. If he's poisoned, he'll appear uncoordinated, he'll have seizures, and he might collapse. This is a red-alert veterinary emergency, so get him medical attention as soon as possible. Depending on the cause, acute kidney failure can be reversed by medication and treatment if it's caught early enough. 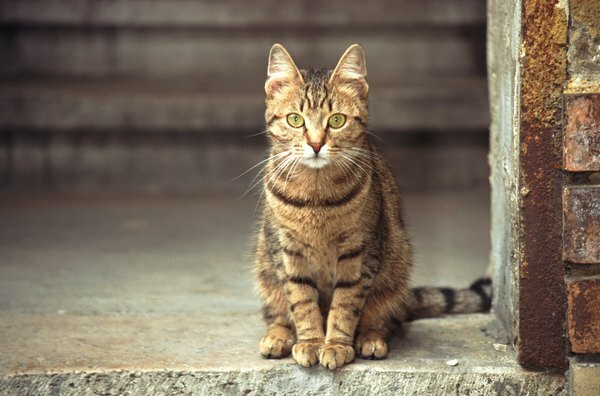 Chronic renal failure usually occurs in older cats, although younger felines can also be affected. The major symptoms include constant thirst and resulting frequent urination. Kitty might also lose weight, stop eating, become dehydrated and seem tired. His breath might stink and his coat can be unkempt and dull. Cats with chronic kidney failure must eat diets that limit protein and salt. Your vet will recommend a commercial or prescription kidney diet for Kitty, or she will tell you how to prepare meals for him. Kitty might require vitamin supplements to aid kidney function, but don't give him any over-the-counter supplements without clearing them with your vet. Because high blood pressure affects kidney function, a cat with high blood pressure also might medication for that condition. Your cat should always have access to plenty of fresh, clean water. If he becomes dehydrated, he'll need fluids intravenously. If Kitty requires frequent IV fluids, your vet might show you how to do this at home. It's possible to arrange for a kidney transplant, if you can afford it, and if the vet believes Kitty is a candidate for the surgery. However, only a limited number of veterinary facilities perform this surgery, and Kitty wouldn't be as good as new after recovery. He would, however, have a companion cat after the surgery, because most facilities require that you adopt the donor cat. These cats are usually saved from shelters, and they are tested to ensure they're a good match for the kidney recipient. Your cat would require immunosuppressive medications so that his body didn't reject the new kidney. Only cats in relative good health -- other than their kidney disease -- can undergo kidney transplantation.